With a provincial economy firing on all cylinders the past few years and a tightening labour market putting upward pressure on incomes, it’s a good time to be working just about anywhere in B.C., regardless of where your community ranks. As the economy cruises along, several cities have climbed above 10,000 in population and onto this year’s list, Whistler, Sechelt and Nelson among them. 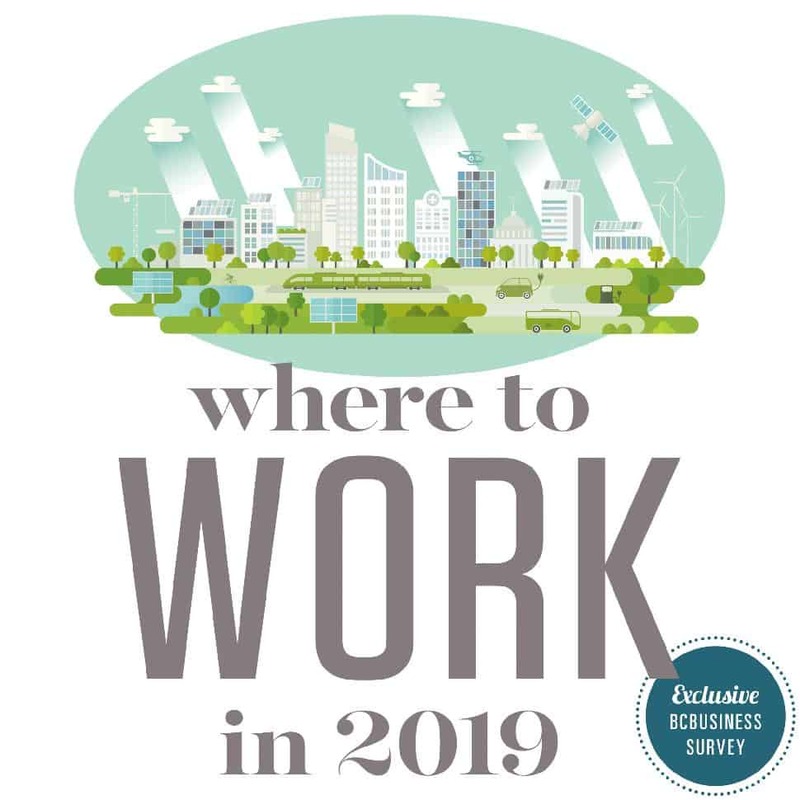 In our fifth annual Best Cities for Work in B.C., we’ve again worked closely with research partner Environics Analytics to determine the economic outlook for dozens of communities, with an eye on the year ahead. We carried over seven indicators from the 2018 survey: average household income, household income for primary earners under age 35, five-year income growth, average household spending on recreation, average shelter costs, five-year population growth and unemployment rate. We’ve also added three new ones: average commute time, average value of primary real estate and housing starts per 10,000 residents. In the process, we’ve fine-tuned our methodology, resulting in a shift of weighting from so-called lagging economic indicators, such as income growth, to more forward-looking or leading indicators like housing starts. This has also struck a better balance between income-related indicators, expense-related indicators and those that signal a city’s broader economic health. Squamish takes the top spot for the second time in three years, showcasing its economic staying power. Neighbouring Whistler makes a strong debut at No. 2, and the nearby District of North Vancouver rounds out the top three. The Sea-to-Sky Corridor owes its strength to several factors, including fast-rising incomes, generous spending on recreation and booming population growth. Squamish edges out Whistler thanks to one of the province’s busiest home construction markets. For this year’s ranking, we’ve taken home-building activity into account to provide a more forward-looking view of a community’s economic fitness. As a leading economic indicator, housing starts reflect investor confidence in a local market and imply anticipated population growth, job growth in construction and development-related industries, and increased retail sales—you have to fill those homes with something. After two years in the top three, the 2018 leaders, Fort St. John and Dawson Creek, experienced notable drops. Incomes remain strong in the Northeast, but the unemployment rate—although still healthy—is outperformed by much of the province. Population growth and housing starts have also cooled, perhaps because persistently low fossil fuel prices are finally taking their toll. But the relative decline of these communities may speak more to the economic uptick elsewhere in the province than their own shortcomings. The District of North Vancouver can attribute its top-three showing to having the highest household income, correspondingly strong household spending on recreation, solid housing starts numbers and—along with the rest of Metro Vancouver—one of the tightest unemployment rates in B.C. We took residential real estate prices into account for the first time, and many of this year’s top performers scored well despite their pricey property markets. For existing homeowners, a rise in real estate values has yielded big financial gains, but not without a cost, notes Isanna Biglands, a Toronto-based research associate with Environics Analytics. If you don’t already own a home, getting established in a community with costly real estate poses that much more of a financial challenge. That’s why we added a new indicator to supplement the average-shelter-spending metric from previous years, which includes data for households that have already paid off their mortgages and so doesn’t reflect true shelter costs if purchasing in 2019. Despite solid population growth, the Fraser Valley communities of Abbotsford, Chilliwack and Mission took a tumble in this year’s ranking. Their weaknesses: below-average performances for income, cost of housing, commute times, housing starts and unemployment rate. However, Victoria suffered the biggest fall, dragged down by low average incomes, including the least for residents under age 35 of any city on the list. One silver lining: with the province’s lowest unemployment rate, it can look forward to higher incomes. The drastic change in Victoria’s fortunes also owes something to another adjustment to this year’s methodology that breaks the Capital Region into its constituent municipalities. This gave greater representation to other southern Vancouver Island municipalities while filtering out some of the region’s higher-income bedroom communities at Victoria’s expense. On a more positive note, the Cariboo made conspicuous gains, with Prince George and Quesnel benefiting from affordable housing markets, short commute times and solid unemployment figures. Parksville and Salmon Arm made the largest jumps—the former assisted by a low unemployment rate and high average incomes for under-35 earners and the latter by robust income growth, affordable housing and a short commute. Although the 2019 outlook for B.C. is positive, economists expect a moderation from the pace of recent years, with TD Economics forecasting a decline in real gross domestic product to 1.9 percent in 2019, from 2017’s 3.9 percent and 2018’s forecasted 2.4 percent. Still, a few key factors could significantly affect B.C. communities in 2019 and the years ahead, including the housing market, oil and gas industry, and global economy. testing and interest rate hikes, housing in much of B.C. remains unaffordable. But where the market goes now is anybody’s guess as prices stay untethered from local incomes. In Metro Vancouver, a modest price correction could make it easier for companies to lure and retain skilled labour, and attract investment. Conversely, continually rising prices may accelerate the economic and population growth seen in cities such as Kelowna and Victoria in recent years. However, as housing in these second-tier urban centres becomes less affordable in turn, there could be a beneficial knock-on effect for the province’s smaller centres. Recent trends in oil and gas suggest that the Northeast is poised for an economic rebound. With fossil fuel prices gradually rising and the LNG Canada consortium moving ahead with its Kitimat export terminal for liquefied natural gas, the production centres of Fort St. John and Dawson Creek will share in the rewards—as will communities on the North Coast. Driving these trends is a growing global economy, with the International Monetary Fund calling for steady expansion in 2019. That could bring more prosperity to B.C. communities, as foreign countries and their residents become increasingly important to the province’s centres of immigration, tourism, education and trade. But given international trade worries and uneven global economic expansion, it remains unclear how B.C. may benefit. Regardless of how your city fared in this year’s ranking, keep in mind that many of those in the middle scored very close to one another. And in a province with a healthy economic outlook, spectacular landscapes and ready access to the great outdoors, even the lowest-ranking cities have much to offer. 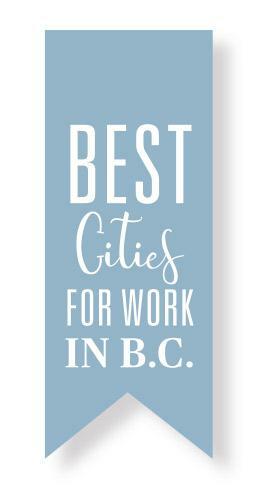 To determine the Best Cities for Work in B.C., we examined 10 economic indicators with a variety of weightings, including seven carried over from last year and three new ones. This year the weighting was shifted slightly from lagging economic indicators, such as income growth, to more forward-looking, or leading, indicators like housing starts. Each city received a score out of a total of 100 points and is ranked accordingly. This figure represents the average for 2018. To determine a score out of 10, we gave the top average income 10 points and ranked the other cities in relation to that. This number represents the 2018 average household income for primary income earners under the age of 35. Again, we gave the highest average 10 points and ranked other communities accordingly. This number represents the percentage income growth from 2013 to 2018. Assuming a floor of zero, the top value received 15 points, with the other cities scoring accordingly. This indicator measures household spending on all leisure tracked by Statistics Canada, from concerts and sporting events to recreational vehicles and home entertainment systems. Giving the city with the highest average recreation spending a 10, we ranked the others in relation to it. This figure covers recurrent housing-related living expenses, such as mortgage payments, rent and utilities, for 2018. The city with the lowest average shelter spending received a score of 10, with the other cities scoring in inverse proportion. This value measures the average price of primary real estate (i.e., not including secondary or recreational properties). We gave the lowest value 10 points and scored the other cities in inverse proportion. This indicator provides the average one-way commute time, in minutes, for all members of the employed labour force aged 15 and older. The city with the lowest average duration received a score of 10, with the other cities scoring in relation to that. This figure represents the proportional population growth of each city from 2013 to 2018. We limited the floor to zero and scored cities out of a maximum value of 10. This value is derived from the year-to-date housing starts from Canada Mortgage and Housing Corp.’s monthly Starts and Completion Survey to the end of September 2018. Housing starts are divided by the total city population and multiplied by 10,000 to give the number of housing starts per 10,000 residents. 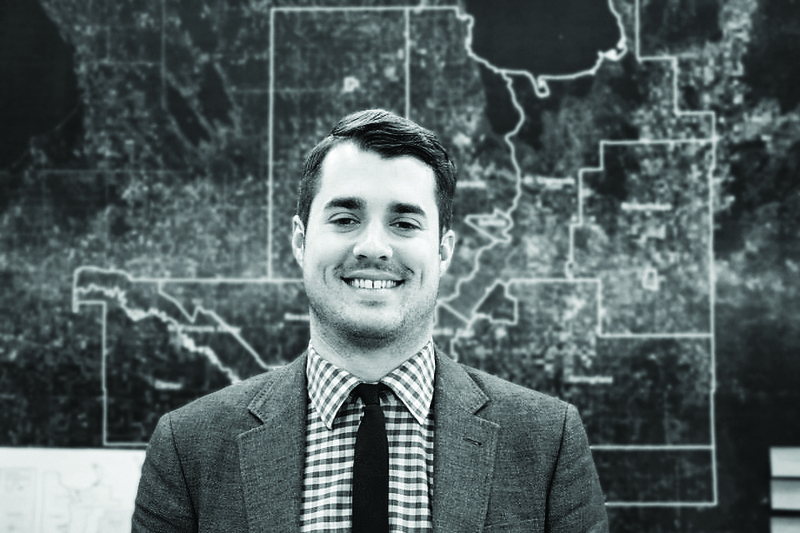 The city with the highest number of housing starts per 10,000 residents received a score of 10, with the other cities scoring in relation to that. This number is the unemployment rate from Statscan’s Labour Force Survey for September 2018. We gave the lowest unemployment rate 10 points and scored the others in relation to that. 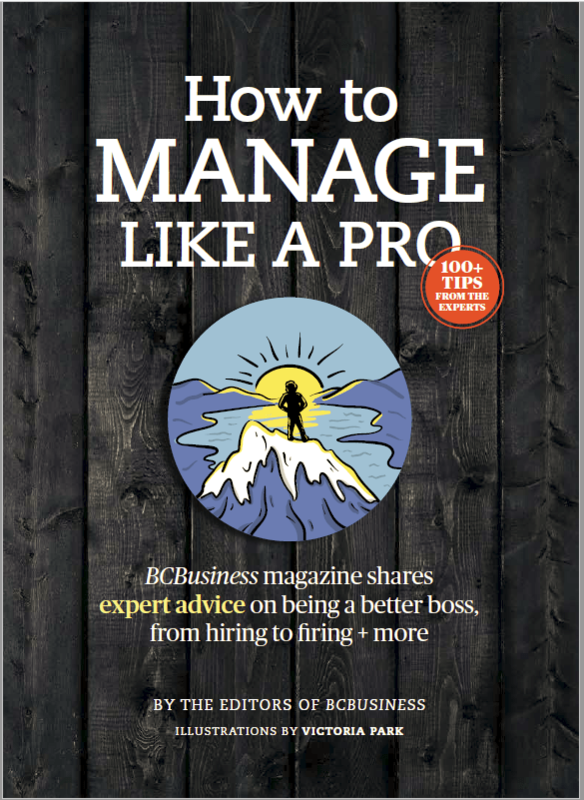 • We excluded bedroom communities such as Lake Country, Sooke and West Vancouver, which may offer a high quality of life but have relatively small job markets. • For the first time, Langley and North Vancouver are represented on the ranking by both their city and district governments. • We work with research partner Environics Analytics because we believe it has the best data available–but even the best data has its limitations. To produce its income numbers, for example, Environics Ana­lytics uses data from Statistics Canada and the Canada Revenue Agency projected to 2018. The unemployment rates come from Statscan’s September 2018 Labour Force Survey, a three-month moving average that only calculates rates for B.C.’s eight economic regions and four census metropolitan areas. Similarly, housing starts figures are provided by Canada Mortgage and Housing Corp.’s monthly Starts and Completion Survey, and only reflect the year-to-date figures collected to the end of September 2018. Therefore, the latter two indicators won’t reflect economic trends for the rest of the year.